After leaving our cozy cottage in Glenade, we drove almost straight across the island to Belfast, Northern Ireland. Same island, but different country, currency and culture. 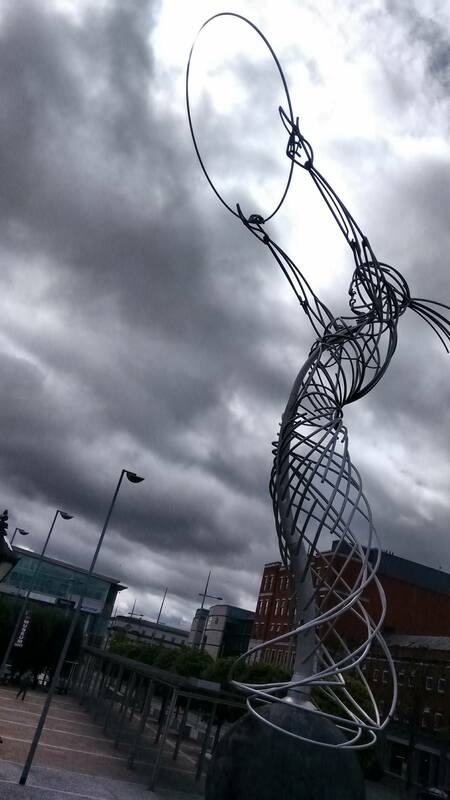 We stayed in an apartment in Belfast that was within walking distance of the Ulster Museum and Botanical Gardens. The museum and gardens are free to visit and we visited them a couple of times during our stay in Belfast. The museum contains exhibits that teach about the natural history, political history and art of Northern Ireland. While touring the museum, we started to get a better idea of the scope of the impact of the “Troubles” in Northern Ireland. During that time, there were 50,000 casualties. While reports of the violence certainly peppered the newsfeed while I was growing up, I never fully realized the scale of the impact on the people here. I have a different appreciation of that impact now. The botanical gardens were lovely, and provide a peaceful space for walking and contemplation. Mom and I both enjoy any opportunity to look at flowers. About an hour and a half north of Belfast, is the town of Bushmills. Just outside of this town is a geological formation known as the Giant’s Causeway. Volcanic activity caused the rock to form into hexagons here beside the water. While it was interesting to see, I’m not sure that we felt it was worth the long drive it took to see it. The highlight of our time in Belfast was our visit to the Titanic Belfast. While the exhibit deals with the Titanic, it also paints a picture of the rise and industrialization of the city of Belfast. It takes a good couple of hours to go through, but is exceptionally well done. We loved it. Right beside the Titanic Belfast (and included in the price of admission) is the S.S. Nomadic. This boat actually delivered 1st and second class passengers to the Titanic and was used for many years as a passenger ferry until it was decommissioned. On our last day in Belfast, we did a “Hop on Hop off” tour of the city. We love doing these. They are a fantastic way to see a lot of a city (and learn a lot about the history of a place) in a short period of time without the stress and hassle of driving to each and every different location. The tour took us out to Belfast Castle, by many, many churches and cathedrals and also by murals and Queens University. The peace walls are something that was hard for us as Canadians to wrap our heads around. These walls were erected during “The Troubles” and serve to separate the Catholic and Protestant areas of town. You can see the barbed wire still on top of theses walls. The walls are covered with signatures and “artwork” commemorating one perspective or another of “The Troubles”. Belfast as a whole, was a prettier city than we expected. And while the weather was cold while we were here, the people were warm and welcoming. We found this city to be a pleasant surprise, and we enjoyed wandering along the streets and learning more about the history of the city.